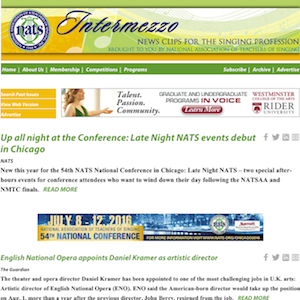 Intermezzo is a weekly compilation of news clips about the singing profession, in addition to NATS news, that is delivered to each member's inbox. Intermezzo tackles today's most relevant issues, gathered from sources like the the Associated Press, The New York Times, Financial Times, NPR and other leading publications. Powered by MultiBriefs. Subscribe to Intermezzo by clicking here.